The trailhead for Vivian Creek is just outside of Forest Falls off of HWY 38. After passing the Mill Creek Ranger Station (or after getting your permit) you’ll hit a U on HWY 38 that takes you up to Angelus Oaks. Stay right and get off of HWY 38 to Valley Of The Falls Drive. The road will dead end into a parking lot and you’ll find the trailhead near the restrooms. Vivian Creek trail starts out along a paved road before crossing over a creek bed to start a steep climb into a beautiful wooded area. The majority of the trail is shaded and well groomed. Due to the water that flows at parts of the trail, there are quite a bit more flying insects than what you’ll find in the San Gabriels at this time of year. Much of the first few miles weaves through fallen trees, and those still living reach to the sky and block all but a few streaks of morning light. The air was rather pleasant, pushing back and forth between the oncoming midday warmth and the morning breezes fighting to suppress it. As the trail climbed higher, we blazed a set of switchbacks that seemed to go on forever and passed a quaint little campsite with bear bags draped high up on a branch. A steady reminder of all the living things that share their beautiful mountain with us. With a few miles to go, the grade of the trail really starts to pick up. The incline coupled with the decreasing level of oxygen really put our lungs and legs to work. The trail began to grow sandy with rocks and pebbles just as we left the protection of the trees. The final stretch to the summit feels like a maze of dunes that have been transported to the heavens. With only a mile to go the trail begins to straighten out from west to east, and the views open up all around you like a long lost town on an abandoned highway. At this point, all of the hard work was done, and although the level of difficulty is somewhat anticlimactic, the elevation refuses to let your mind forget how far and high it’s climbed. 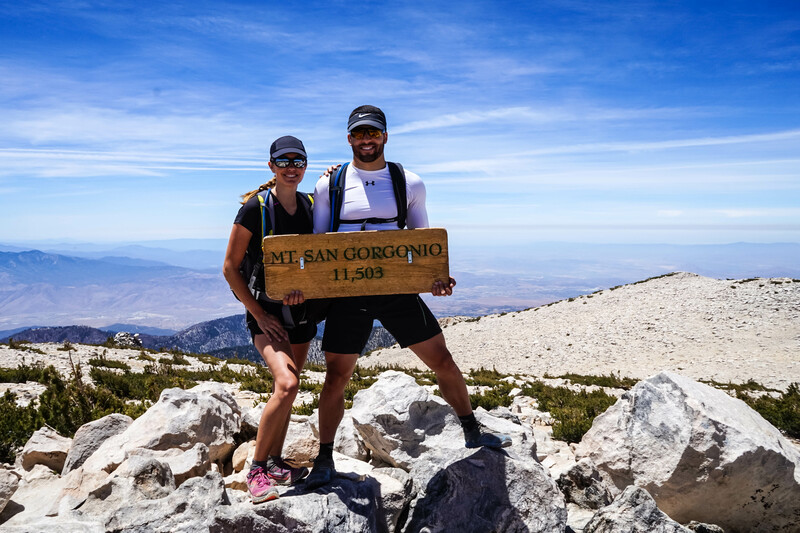 As the trail dead ends at the summit and takes one final right turn, we arrived at our destination, and finished the So Cal Six Pack of Peaks!! Instead of traveling the same trail on the return leg, we took the Momyer Creek Trail. This trail is quite a bit longer than Vivian Creek, but has much less traffic. It was a beautiful descent back to Forest Falls and a great end to our Spring training.